Is there anyway to get the shift point changed from 1st to 2nd as the car seems too upshift to quick in D & S sometimes causing the car to feel a bit sluggish. If I drive in M and change into 2nd later, it feels much more fluid and I wish it was like that in D.
Does depend on the throttle position when it changes up. Will change up at higher revs when you floor the throttle. A lighter throttle and it changes up sooner. If all that is ok then a sag remap is required. Trackday Grandad enjoys his Westfield at every opportunity, woo hoo! A3 2.0 TFSI Quattro Stronic. Now added free bonuses--------A Bus pass, free prescriptions, winter fuel payment. DSG adaptation does not learn your driving style, it's an urban legend... It adapts to clutch plate wear and other environment variables. You can effect gear changes with more aggressive throttle application, but that's just TCU software following its programming. To get shift points adjusted you will need to get the TCU mapped. It is possible to change other parameters/behaviour as part of that also. Thanks for your message. I did a reset a little while back and it did appear to improve for a short while, but it has gone back to how it was before the reset. Sounds to me like you have a problem, i tried my stock DSG tonight in Sport and it revs to 5-6k on a normal pull away from standstill before it changes and if i boot it it goes to the red line in 1st. Ha that's nothing, i floored mine in Sport and it went back to last friday ...bit of a nuisance really as i was looking forward to tomorrow. Genius and Rideen like this. The car has done 74k it's s tronic and sealed for life so oil doesn't need changing. I'm dried driving it hard from 1 St this morning and it went up to the red line before changing, so it might be me and when I'm in stuck traffic, I find it changes at a lot lower revs. They're not sealed for life units as far as I know. 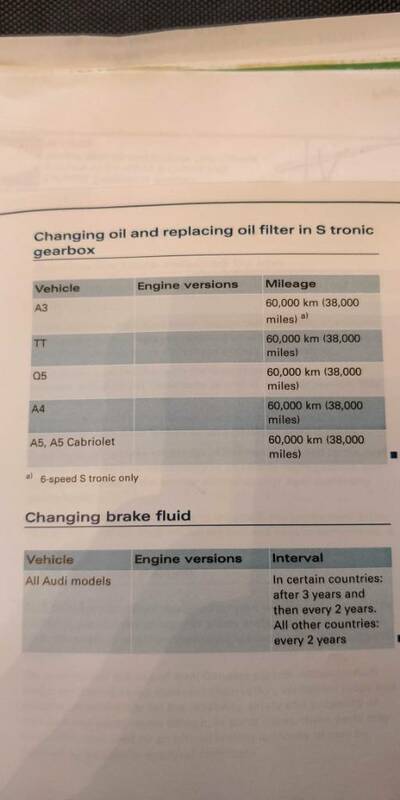 I had a B8 S4 with the STronic and that had a stated oil change interval of every 36k miles. I picked it up at 72k, it was then borked at 78k but the previous owners had missed the first oil change so I had no comeback. Change from D2 to D1 became painfully, and pulling away in D1 I got massive clutch bounces. Needed a new solenoid or a mechatronic unit. My current 8p S3 has a gearbox oil change marked in the book at low 30k's (can't remember exactly when). Have another look at the service book, if I were you. Ye it had a service at 30k odd, no oil change. I contacted the original Audi garage to ask why, they said the box doesn't need one. I then contact 2 other Audi garages local to me and they said the same, that the box is sealed for life. Interesting, and I'm not convinced they're right, despite being main dealers. 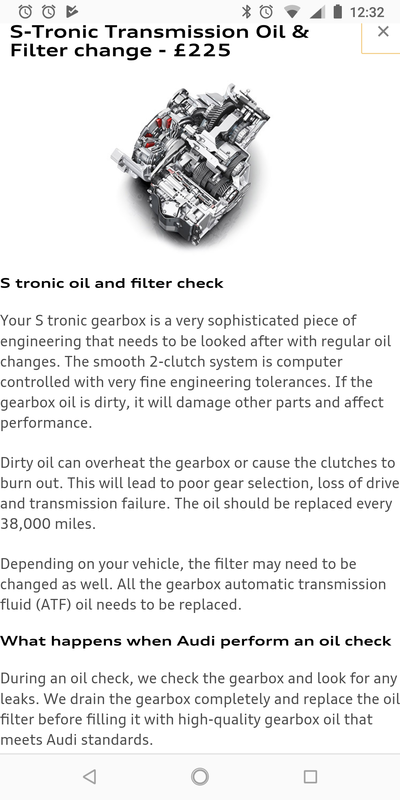 There's a separate note in the service booklet about oil changes in the STronic (see photo). There are quite a few businesses around that do STronic rebuilds of clutch packs, Mechatronic units and occasionally solenoid rebuilds. If the gearboxes are that awesome that they're 'sealed for life' and have no service requirements, why the third party servicing support? Just a question from someone bitten by an STronic. You need one of these I reckon @ABYSS from DTUK (Site Sponsor) can sort you out. some seriously positive reviews from all sorts of makes/models of auto boxes. Hmm interesting! Think I will look into it a bit more! Either way it definitely needs servicing soon! Get it changed along with the filter before it does any damage. It is supposed to be done at 40k miles so double that is really pushing it. I was lucky, I think, that mine was OK given the state of what came out. Is yours an s tronic? And did they tell you it's sealed for life? Also did you notice any difference to gearbox performance? Yeah, mine is the S Tronic from your photo looks like its a similar age to yours too. No one told me it's sealed for life, because it's definitely not. It went into Audi and had their "health check" just after I bought it and they advised getting it done, as it was overdue, but given the price they quoted and the great DIY guide I found on here, I did the service myself. So I just rang Audi again and asked for service on my gearbox, they were adament that mine is sealed for life and is not a serviceable part. Which dealer are you calling? I've rung Cardiff, bridgend and the origunal dealer in scottland it had it's first service. All confirmed sealed for life! OK really confused now, mine is definitely every 40k service, are there more than one version of the s tronic in the 8p? OK guess I was wrong here as were a few of us. So I rang Huddersfield Audi and they also confirmed sealed for life, so I'm going to take it as it is then. They said it's car specific. However while writting this Audi huddHuddersf rang back to say there's an outstanding recall for the diesel exhaust emissions on my car...joy!! yeah figured it out yours is a 7 speed non quattro, sorry for confusing you. Also diesel emissions recall should be optional? Really appreciate your input guys, thanks. @Dynamo86 - do not get the diesel emissions update. This is the outcome of the emissions scandal the other year. They’ll detune you car - you’ll regret it. Plenty of posts on here about it. Further, don’t bother with the Main Dealers - there may be one or two good ones out here but typically all they are good for is purchasing a new vehicle from. Find yourself a good VAG specialist. Ye I'm not getting the emission update, to be honest the guy I spoke to at Audi on the phone indirectly told me not to bother so I'm going to leave as is.